This is the second of my Miss Sparkles and this time I have gone for the vintage distressed look. The promarkers I have used are Ivory, Blush, Dusky Pink and Pastel Pink for the cheeks. The dress includes Pumpkin, Honeycomb, Peach and Burnt Orange. The wings include Azure, Denim, Powder Blue and Pastel Blue. The head-dress has Burnt Sienna, Cinnamon, Tan and Shale. 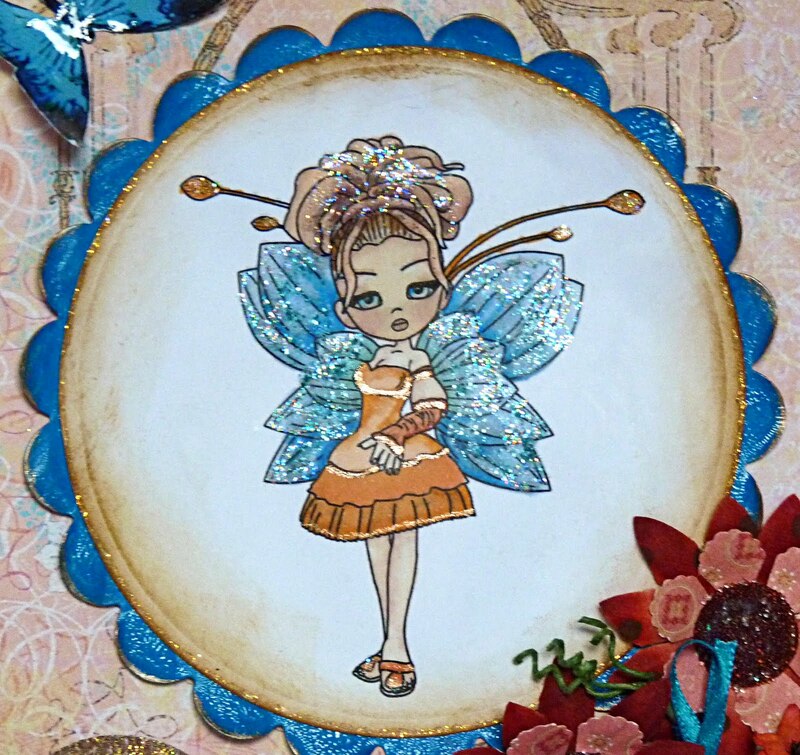 To achieve the sparkly look I have used Broken China Distress Stickles on the wings, Cosmic Shimmer Autumn Twinkles on the head-dress and Sakura pumpkin coloured Gelly Roll glitter pen on the stamens. I am not so happy with the face this time, the colours seem to have bled in with the photocopy ink, and what annoys me is I am using the real Epson inks and not the look alike ones. Anyone know how I can stop this please? I really like the Nellie Snellen embossing floral punches and have used them on both cards 1 and 2. On this one I have used them with bought ones (no name on the box I am afraid). 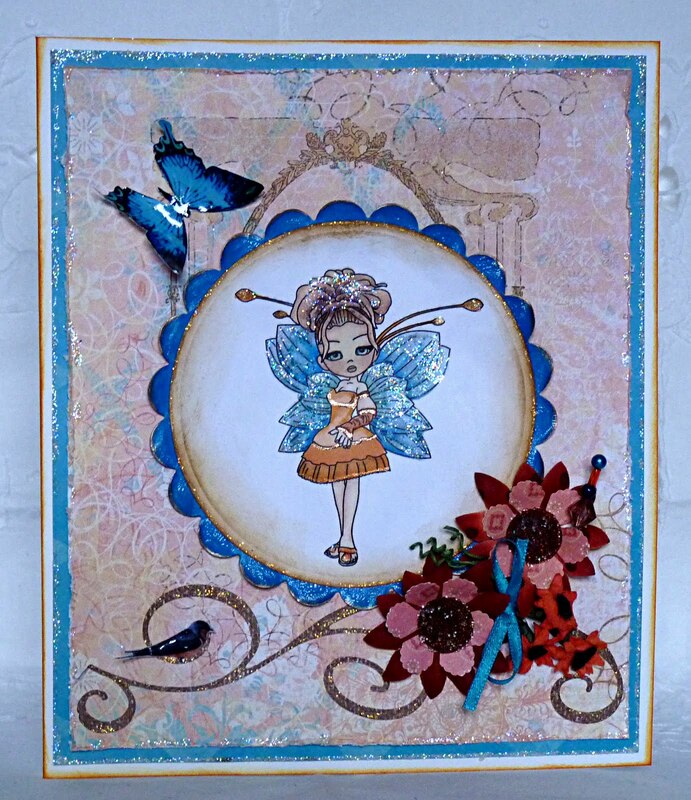 I have included my usual butterfly and bird, both cut out and covered with glossy accents. I edged the scalloped die-cut with clear crackle paint and rubbed in Interference Blue Pefect Pearls. The edge of the circle die-cut was distressed with Vitage Photo DI. The flourish is TH Swirly. I also tried something completely different again on this card. I had a frame downloaded on my computer, so I printed it onto the DP as part of the background. Backing papers were edged with Star Dust Stickles and Frosted Lace sprinkled with glitter. Well that's my second sample for the OSAAT DT call. Wish me luck. Have a great weekend when it arrives, the weather looks quite promising for the festival, so fingers crossed. Fabulous card, I love the image, it's so cute! 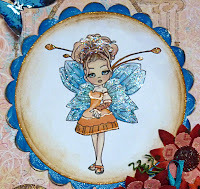 Thanks so much for joining us for the Pollycraft Challenge. Thanks for joining us at Corrosive Challenge this week. Such a fabulous image and pretty colours! Hope you are having a fantastic time at your festival! first of all would like to congratulate you on such an interesting and different(which is what I love)blog it really is amazing, dont know how I havent come across you before. your last card is gorgeous as are all of the others on your blog. wow so cute card !! I love the glitter look ! !thanks for joining in our challenge. Hi Brenda, welcome to the team! fabulous card! !